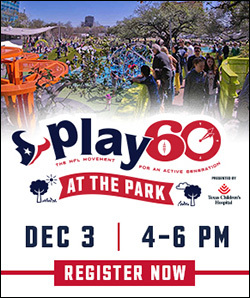 Join the Houston Texans and Texas Children’s Hospital at Levy Park Houston on Monday, December 3 for an evening of fun-filled events to keep your kids active! Levy Park is located just south of Richmond Avenue between Kirby Drive and Buffalo Speedway in the Upper Kirby District of Houston. Check-in upon arrival for your PLAY 60 at the Park Passports. Completed passports will be eligible to win prizes. PLAY 60 Games, Photo Booth, Face Painting, Toss Up and more. Texas Children’s is the Official Children’s Hospital of the Houston Texans and presenting sponsor of PLAY 60.